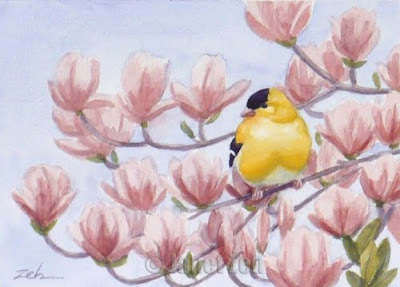 Everything about this painting says Spring: the yellow finch in his bright spring colors, the soft pink magnolia blossoms against a pale blue sky. I was pleased to see that despite rain, the magnolias are still blooming. This little finch has been visiting my birdfeeder. The goldfinch and the blossoms make a lovely painting together. My bird paintings and prints are for sale at JanetZeh.Etsy.com.